Busy Last Week of School! Michelle Atkins, Sandra Brandsma, Krista Burden, Milanna Cecco, Ty Davidson, Theresa Fenkhuber, Josiane Gauthier, Heidi Gowan, Sara Hiebert, Ken Jamieson, Ryan Kenny, Alain Muise, Aura Rivette, Paul Rosman, Alida Wagstaff, and Roni Wocknitz. Thank you to everyone above who has, in their own wonderful way, made a difference for our students. A special farewell to our “Mr. J” who is retiring. Mr. Jaimeson’s absence will leave a huge hole at SMS as he has had a positive impact on so many students (including two Woodhurst boys) over the years. We will miss him, but we know we will see him at the annual staff versus students hockey game he has made a tradition at SMS! We wish him well in his new adventures and hope he will also come back to visit as a TTOC when he is not travelling the world or helping our community on Salmon Arm’s City Council. Best of luck, Mr. J! Joining the green team we have Wyona Maddigan (grade 6 Late French Immersion). We are thrilled that Emily Keenan has decided to stay in beautiful BC for another year as well! The red team are excited to have Andi King join their Early French Immersion (grade 6/7) team. Our yellow team is almost brand new: welcome to Laura Jegues, Jaime Russell, Danielle Brunwald and Megan Weir (grade 8 French Immersion). Gilbert Hobart is returning from leave to the yellow team as well. Joining orange team we are happy to have Deanna Brennan, Chris Matheson (also one of our new vps) and Marlee Penner (grade 8 English). We have one grade 6 position that we hope to fill this week, as well as a few part time positions. 2018/29 is shaping up to be a fantastic year at SMS! 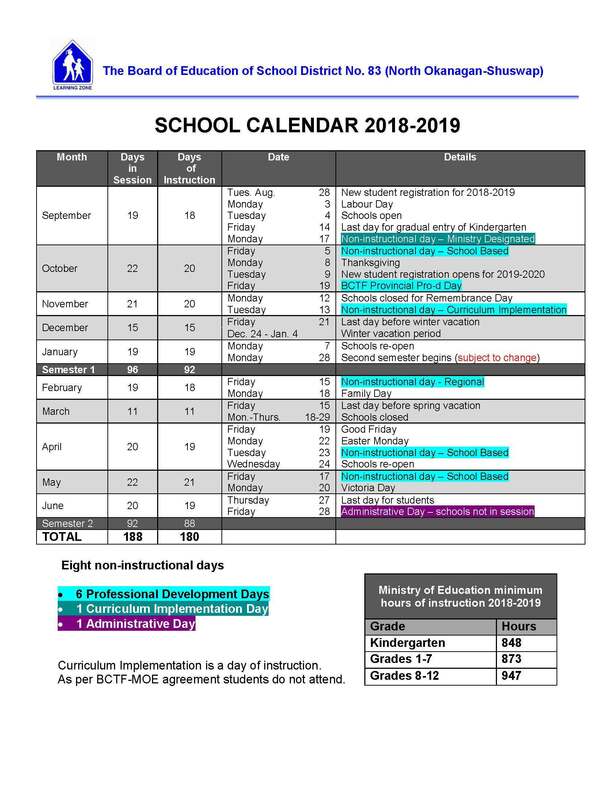 Mr. Jory has asked us to share that parents and guardians of eligible children are reminded that a deadline is fast approaching to sign up for the $1,200 B.C. Training and Education Savings Grant. Please see the website below for more information. As per our Spring Update in April, requests for educational reasons were due by May 17th. While we have had a number of late requests between the due date and today that we have taken into consideration while forming classes; we will not be able to accept any more late requests. Please know that current teachers (including grade 5 teachers), our learning resource team and counselling team, along with administration put a great deal of thought into forming balanced classes that will work well for our students. – last day for locker cleanout. Please send an extra bag with your student. – Grade 8 Dessert and Dance. Doors open at 6:15. I continue to be amazed by the dedication of our staff at SMS. The year end slide show has photos of many zone championships in sports; numerous activities students may join at lunch or after school: robotics, chess, sewing, magic cards, pintrest, coloring, French, library to name a few; talented concert and jazz bands, and so much more. Even in the final weeks of school, students are engaged in learning and the school has a safe and respectful academic tone. I would like to thank our grade 8s for their positive leadership this year, and all students for their hard work. We look forward to our grade 7s as leaders next year, and to welcoming our new grade 6s. As always, please feel free to contact us in the office with any questions, suggestions or concerns. I will be available by email in the summer. Our office team will be back in action on August 20th. Have a safe and fun filled summer! Previous Article Fabulous Band Concert!